What is the UK signaling to the US and China? 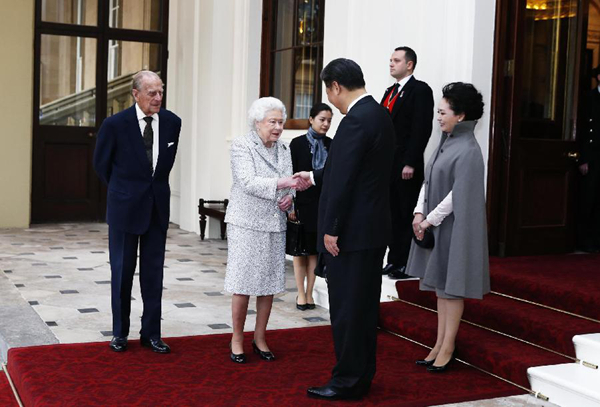 Chinese President Xi Jinping's visit to Britain has grabbed headlines of the major British media outlets. It is very easy to get distracted with the pomp and pageantry in this island Union nation, but one can still feel the tectonic shift going on in UK Geopolitics. It's easy to lose focus on the purpose of this historic meeting, and I hereby propose that the UK is subtly signaling to both the US and China. To China the implications seem clearer, to form a mercantile partnership completely devoid of the historic political relations and animosity during the Cold war. It is also simultaneously signaling a shift to the US and European Union, about its independence in foreign affairs. Reuters mentioned that "Cameron is pitching Britain as the pre-eminent Western gateway for investment from China". The Guardian wrote, "The fresh support is to bolster the research British and Chinese experts are working on together - in fields including nanotechnology, bioengineering, computing, advanced materials, environmental engineering and public health", as President Xi and Chancellor Osborne visited the Imperial college to see new advanced medical robots. First, let's discuss UK signals to China, which are quite clear. The future of British trading in the EU is uncertain. China is equally looking for research and development partners who have a rivalry with the United States and Russian research going down the drain. The European economy has stagnated and is suffering from fundamental flaws, one which can only be solved by complete disintegration, or complete political unification and fiscal laws, both of which are not going to happen. The resultant policy paralysis is harming European growth and affecting the British economy. Tied with that is the overall migrant influx, massive strain and anti-EU sentiment. The UK is trying to make it very clear to Chinese leadership that there is an open invitation to partner Britain in future technology driven development. As China is trying to internationalize its currency, Britain can provides the biggest opportunity to do so. The steel industry is one area where there has been a successful reliance on Chinese produced steel. Chinese investment in the housing of London is also sorely needed, as the capital is reeling under a lack of affordable housing and jobs, as mentioned repeatedly by Boris Johnson. Take a close look at British media coverage on President Xi's UK visit and observe the tectonic shift going on in UK Geopolitics.